The things you just can't give away. Having just shifted house I'm currently in the final stages of unpacking, and deciding if I really need everything I've just hauled out east. 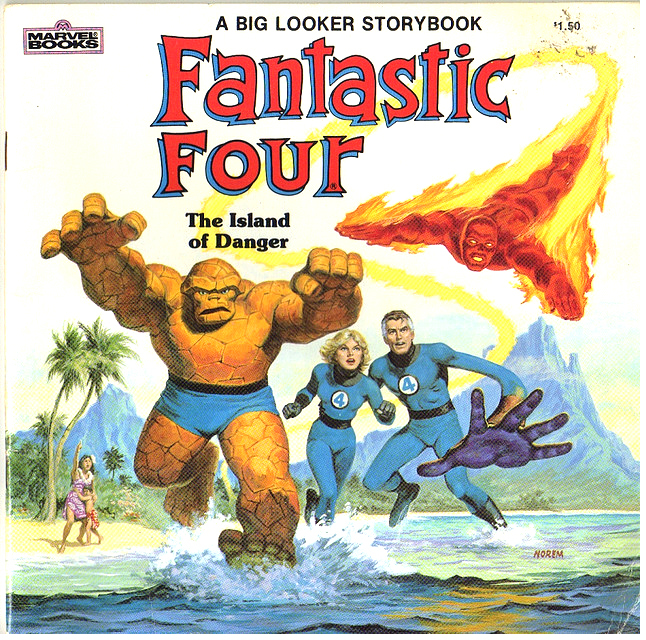 One box opened contains a whole lot of stuff from my younger years, including the Big Looker storybook Fantastic Four: The Island of Danger. It's an instant addition to the keep pile, because God help me, if John Byrne's run on the F.F. hadn't have made me a fan for life, this book would've. It's not so much the Thing's bickering convincing Sue and Reed the family need a south seas island holiday (meaning they were virtually next door) that sells it, but the art of iconic Conan artist, Earl Norem. As the quartet are quickly put to work stopping a tidal wave with similar holiday plans, Norem's paintbrush makes the blue spandex seem logical beach attire, and making the four's human selves actually look like real people. 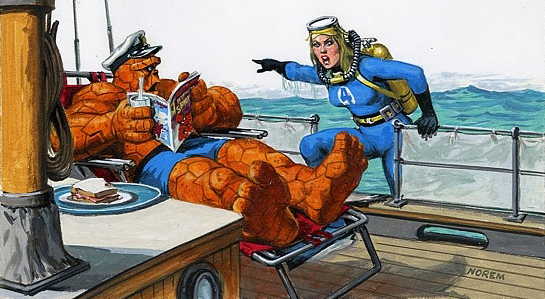 Sue interrupting Ben's 'me time' with a glass of milk, a sandwich and a copy of The Amazing Spider-Man, to get him to help Reed and Johnny battling underwater against a giant octopus. The way Earl nailed Ben's face is priceless. Sure it's stunned, but it also suggests he wants to ask the main woman in his life if he can just finish his comic book. I think we have all been there. 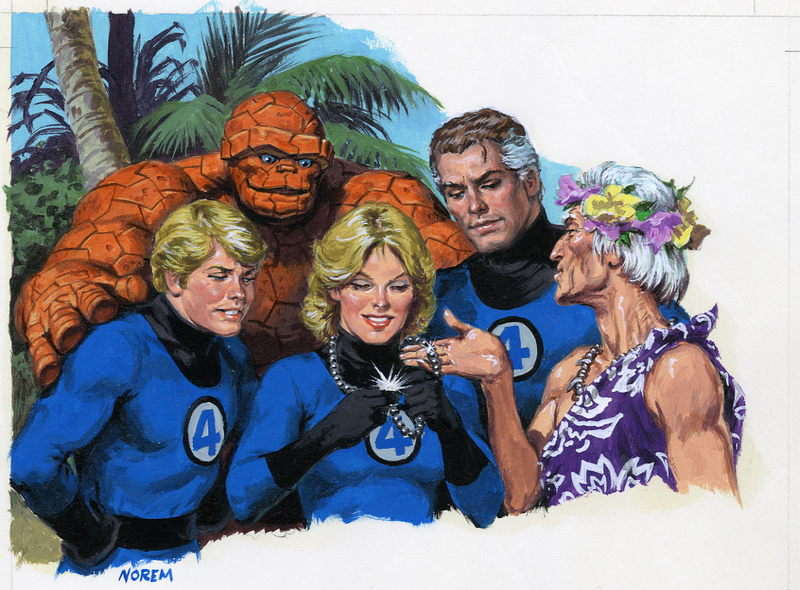 oh man this so reminds me of that Brady Bunch episode where the family is in Hawaii and one of the boys (Greg or Bobby) has a surfing accident because of some cursed tiki statue pendant he's wearing. cmon people don't tell me you never saw that episode! 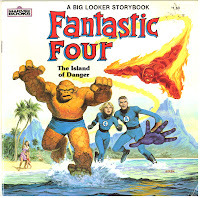 Pretty close David, while I've never seen the Brady Bunch outside the parody movies, here the giant Octopus is guardian of the biggest pearls imaginable, and the four are warned from going after them. But where would fiction be if folks did as they were told? It is pretty awesome as far as art goes, I had to photoshop the scans a bit as the colours had aged quite a bit in my copy, but what I'm surprised to find now is this book has been upgraded to read-along cassette and audio book.